The ads include a map which campaigners say shows the occupied West Bank and Gaza Strip – as well as Syria\’s Golan Heights – as integral parts of Israel. The ministry said that in general, maps should not be used on billboards. But it denied a Transport for London statement that it had asked for the offending posters to be removed. Transport for London said it has received about 600 complaints about the poster, while the Advertising Standards Authority said it had had 300. Hugh Lanning of the London-based Palestine Solidarity Campaign said the adverts were a “disingenuous attempt to remove the Palestinians from the public mind, and create a false impression about what constitutes Israel”. 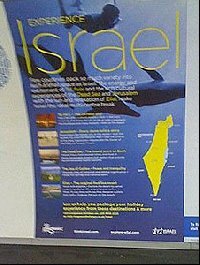 The posters were “selling a lie” by suggesting tourists could visit Gaza when the Hamas-run strip is subject to a strict Israeli blockade under which even some doctors and humanitarian workers have been denied entry, PSC said. The map shows Israel, the West Bank, Gaza Strip and the Golan Heights in the same striking yellow colour; the faintest of white lines mark out the Palestinian territories – though not the Syrian one which Israel annexed in 1981. Israel occupied the three Arab territories, including East Jerusalem, during the 1967 war. It has since cemented its hold by settling hundreds of thousands of its citizens there. Oren Drori, Head of Marketing Administration for the Israeli Ministry of Tourism, described the adverts as a \”professional mistake\” with no geopolitical intentions. He said he did not think maps should be used on billboards to advertise tourism in any country and the adverts had not been sufficiently vetted. \”We are not tearing anything down,\” he said. But the ministry had decided to \”fast-forward\” to the next set of posters scheduled in the campaign, after learning that there was \”a bit of a harsh response\” to the map advert, he said. No more map adverts would be posted, he said, and existing ones would be removed as they reached the end of their scheduled display times over the next two weeks, he said. The Syrian Embassy in London, which had lodged its own protest, described the advert as “offensive”. US President Barack Obama is trying to kick-start talks to reach an negotiated agreement creating a state of Palestine in the West Bank and Gaza, although Israeli Prime Minister Benjamin Netanyahu has not signed up to the idea. The fate of the Golan Heights is key to any peace negotiations between Israel and Syria.